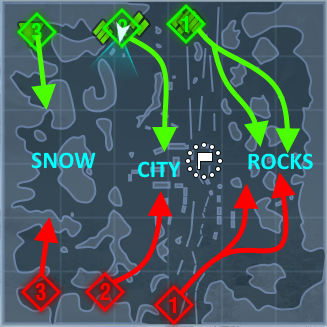 So here are some map-by-map suggestions of where different tanks should go to gain a decent coverage of the full battlefield. If you still believe a 7-men rush is the ultimate strategy, then I hope this will show you better ways to win. I would really love the help of people that are more experienced than I do, so feel free to add suggestions or even tell me what is wrong, I'll try to edit the guide accordingly. Note that I'm not playing in english, so I don't have the exact map names, but you should be able to identify them. I'll give advices to where to put your TDs (triangle on maps) as it's sometimes very difficult to use them, and I'll even give tips on how I usually play with my US heavies, starting tier 7, because you need that strong turret to make it work (stripped squares on maps). On this map, there are usually 2 paths to follow: either you go to the close stone bridge on the eastern part, or you go to the base and around. I have seen tons of games on this map, where a team try to go on bridge side, and finally lose to a quick capture, even if they lead the kill count. So I think, one of the best tactic is to use 1 or 2 tanks to lock the stone bridge, while the others go to the base. It's usually better to use a US heavy close to the bridge for spotting (see the 2 marks, hide there, only show your turret and angle as much as possible) while a TD sits back around spawn position and prevents anyone trying to run through the bridge. The best way to beat this lock is to use a group of fast medium tanks and rush the ennemy defenses, but be prepared to suffer losses. If your team manages to reach the base first, you should be in a good spot. Abuse the covers and snipe anyone trying to stay in the middle, around the river. When you are heavily damaged, just go on the base area and stick right next to the wall until countdown hits 100! In short: lock the stone bridge and concentrate on base area. For US heavies: this map is good, defend the bridge or run to the base and use the small hills here and there to only expose your turret. This map is far more complex. The base is too exposed for a sneaky capture, and crossfires (or even friendly fires) often happen if you are on the front. So you will notice that many people use the south path because it is less exposed, resulting in funny traffic jams. But it is not a good idea against decent players. South path can be really easily countered by a single tank sitting on the stripped square mark, behind the small wall. From this point, the defending heavy can often have a few shots on incoming ennemies before they can hit him, and he even has a way to flee if he is really overwhelmed. if he is supported by a TD at spawn, it is likely to end in a bloodbath. But the inside path is kinda hard to use aswell, because of the frequent crossfires. You need to be carefull there. I'll recommend going inside only with non-US heavies, because you're very likely to be hit on sides. The outside path should be the way to go for medium tanks, as their good mobility might help them to reach the back of ennemy lines while the fights are still ongoing. In short: lock the south path, control the inside path and try to turn around using outside path. 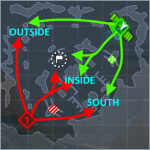 For US heavies: I like the defensive position against south path, but it's very rare that I get this postion as there are always a pair of people going south. You can also go outside, as there a a lot of small ruins and hills where only your turret is exposed. Maybe my favorite map. It favors a lot US heavies, and it's quite fun to play, with 2 really different fight styles depending on wether you're in the city or in the desert. Talking strategy, it's quite straight forward. 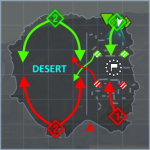 Spawning algorithm will place medium tanks in the desert where they should try to turn around the ennemy team. You should not use the hidden path on the very west of the desert, unless you have somme support on top of it. TDs are OK on this map: just go to the limits of the map to snipe ennemies spotted by heavies. If there are 2 or more TDs, it's always a good thing to have 1 supporting the mediums in the desert (but be ready to go back in city). Heavies have to face in the city. Do not stay in zoom mode forever, watch your radar, be mobile and you'll do OK. Also remember that you can sometimes shoot through the train tracks to hit ennemies in the desert. 1- desert ruins are quite helpfull to hide. 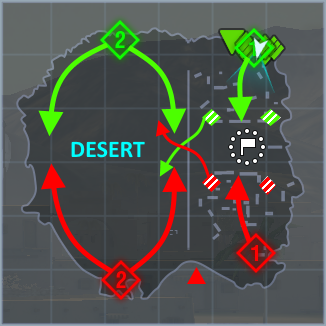 2- the big dune between the 2 spawn points provide an awesome snipping position both for desert and city. In short: mediums run in desert, TDs snipe and heavies fight in city. For US heavies: one word: SANDBAGS! Sandbags are everywhere, abuse them! There are a least 4 good positions (as shown on map) where you can put your fragile armor behind sandbags (get out of zoom view to take position, so as not to destroy the bags by mistake) while spotting and fighting with your turret. My ideal position is the one in the middle of the map, because as shown on map, you can quickly move to the desert part if your help is needed there. Difficult map, very technical with the tiny streets. Always keep an eye on the radar to be sure no one is behind your back. Usually, the spawning algorithm gives you perfect position: medium tanks on hills (don't forget to give support from up there! ), heavy tanks in the city. TDs are terrible on this map, only the south position is good for snipping, but against decent players, you'll be forced to go down in the city and be exposed to more mobile tanks. Do not use the base path in the middle if you don't have fast medium tanks on top of the hills to spot ennemies for you. For US heavies: this map is hard for us. It's always face to face with almost nothing to hide your weak front armor. Just be sneaky and wish that ennemies are not smart enough to catch you. This map is quite frustrating for heavies. If you happen to be on the wrong side of the map, you're screwed and you'll be useless for your team. But it is an excellent map for TDs and mediums, in my opinion. All mediums should fight for the central position (mines on the map). It is crucial, because the team that control this position can spot on the whole map and hide easily behind cover after each shot. And it's also the reason why chosing the city path is often a bad idea, unless you have controll over the central area. And because TDs should camp in spawning position, any attempt to rush from the city can be easily stopped with the crossfire. For heavies, you can go either west (bot not more than 1 or 2 guys), base (use rocks to hide) or mines to support the mediums (only if you are fast enough). Beware of snipers in TDs once you've been spotted. In short: control the mines = control the fights. For US heavies: I love being in the mines, but it's risky to reach this position. As they are faster, russian heavies might do the job better than you. West path is really good if you spawned on north camp, as there are a lot more hills to hide from spawn campers once you've reached the south part of the map. This map is very small, and every position is quite exposed. That's why I strongly recommend not trying to capture the base or go in the middle of the map at start, or you'll get it from all sides at once. Most of the time, south path is locked. It's very hard to win an engagement here, unless you really outnumber your ennemies, because the first guy to step forward will take heavy damages. North path is more mobile, so I think the guys from south should try to support as much as possible north side, without exposing themselves. All types of tanks can go everywhere, and TDs have a few good positions to take around the buildings on both path, or even just at spawn, snipping anything visible. In short: be carefull south, but try to push north. For US heavies: the southest path is good for you. Pin the ennemy team there to ensure your mates can support north and your job is done. Another small map. I used to hate it, but now I have found a few interesting positions that help a lot in protecting my tank. First thing to know is that you should not try to go in the base, unless you have total control of the bunkers area. If someone starts sniping you from the bunkers hills, you'll be really in a bad shape. And anyway, the map is so small that anyone can defend the base easily. 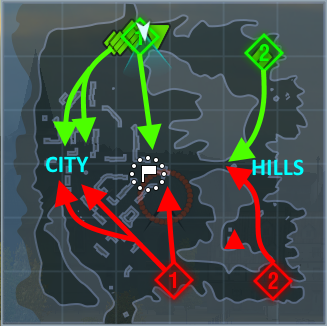 In my opinion, the team that secures the bunker hills will secure middle area and then base area. 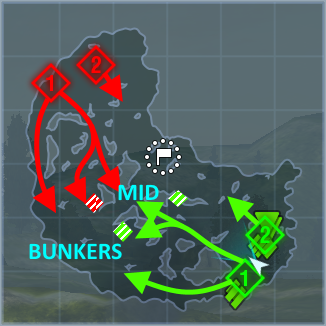 So mediums should beroaming around the bunkers while heavies help them or defend mid. Only 1 or 2 TD should stay around spawn to snipe. In short: secure the hills with the 3 bunkers, hide from campers at spawn win the battle. For US heavies: it's far better if you are in south team. Use the small hole between the 2 hills (the mark south of base on map) to land a pair of shots on ennemies at start. 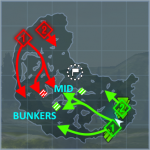 Then join the bunker area and hide behind the small hills there to only show your turret (see the 2 marks on bunkers area of the map). If your ennemies rush, your mediums should destroy them. If your ennemies stay far, you will be invincible in this position. I used to love this map. It was so easy to just rush the rocks on eastern part and snipe anything here and there trying to approach the base. But now in higher tiers, rocks are a pain to secure, most of the time. - if you have many TDs, you'll have hard time in rocks. 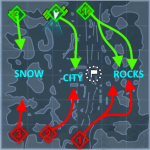 So try to control the snow part and protect TDs snipping from spawn, before securing the city. Be carfull in the snow, don't go there alone. - if you don't have many TDs, let them die (sorry guys :-p) and go for the rocks with at least 2 guys. People going for base should be ready to give you some support and vice-versa. TDs should try to hide somewhere around the trains (this way, they are less likely to be flanked), but remember that you can fire shots through some trains or below tracks. For US heavies: both snow and rocks will provide you opportunities to show your shiny turret. Do not enter the city/base part too soon. Please give me your feedbacks, share your tricks or positions, so that this guide will get better and better! Edited by EvilsPresley, 29 July 2014 - 10:18 PM. What you are saying is kind of correct. Great effort on putting your thoughts on "paper". You will crush all the defences in those areas quite easily and opposing team will have absolutely no time to take the base (takes quite long actually) as your "iron fist" will rush to the base in no time. Yep, I'm working on russian mediums, and the strategies are really different. I'm not sure if a 7 men rush is the best strategy. It is if you are mainly heavies, maybe. But 5 or 6 men with good camping position can stop that kind of rush most of time. Hi ElvisPresley, nice guide! I've found it too late ... I'm using basically american T20 and T34 and i find the tactics very accurate. 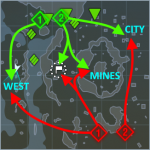 It would be nice if you do the guides for the two new maps! Anyway,thanks for the information. The 2 bridges aka "Falls Creek"
I also prefer the tactic "2 US heavies or 1 US heavy +supporting TD" holds the bridge while others cap the base. I do not see how the control over the bridge gives one any positional advantage. 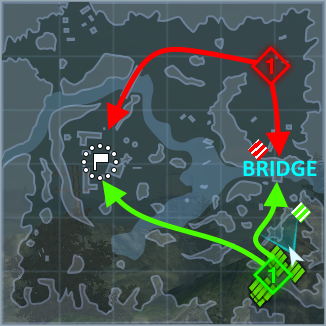 However, if one ignores the bridge completely, the enemy can flank you on the move on open area and that is not gonna end well. 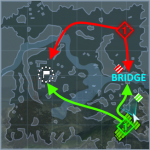 In case both the teams are dedicated to win the bridge, mediums and/or faster heavies (IS, M103, T1 Heavy) can pass the water, flank the enemy and cause disorder in their rank. Works sometimes well, but is a risky tactic. Need to be careful with enemies who have moved towards the base since then the flanker gets caught in crossfire. The desert aka "Desert Sands"
Just to add one more advantage on the South side: There is a good hull-down spot next to the rails just South form the center line if starting from the South spawn. One can retreat just few meters for save reload never showing one's hull. Since most of the city action often happens on the West-most lines/streets, there is a good sniping post on a small hill in the South-West corner. One can often shoot undetected due to the distance. Works better for more accurate German / American TDs. Just do not start camping there if the battle leaves the area where you can shoot. I disagree that Heavies should go to West route. Both Mediums and Heavies should rush to the central hill and take control over it. 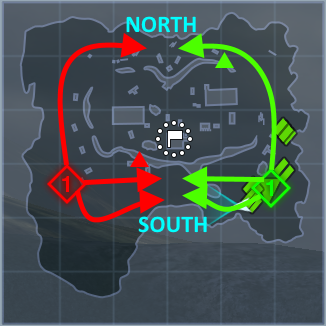 If starting North Spawn, one to two TDs should take the island where the lighthouse is and shoot enemy heavies trying to take peek over the ridge. One South spawn TD should go to the hill next to #1 spawn and control the enemy TDs on the island and shoot to the hill. Although the TD's ability to support Heavies/Mediums on the hill is bit limited. TDs with strong frontal armor (T28, Ferdi, etc) should join for the battle of the hill. Trains in the snow aka "Death Rail"
Another "Ruuun tooo theeee hiiiiills"-map (I always hear Bruce Dickinson singing when this map loads). One must win the hill at the mill (North East corner). All the Heavies and TD's should go there and preferably mediums too. Always go on the North side of the windmill so enemy TDs cannot snipe you. Be patient not to cross the ridge too early since you are likely to make yourself an open target. But once the balance is on your favor, go over decisively since there might be enemy flank coming Southern route. Mediums can try to flank the enemy from North route just below the hill - just be aware of enemy TD's near spawns. Heavies should go all the way to the corner, especially if starting on the East side. There is a good hull-down spot there for US heavies etc. Bridges / falls creek: Do not be afraid to push over the bridge when it becomes clear the reds have gone en masse to the CAP. They wil have the numbers on their side in the fight at CAP and it is only a matter of time before they will finish them and the CAP counter starts ticking. Winning the bridge gives a team the advantage of sniping to the cap and attacking from 2 or 3 sides to the team defending the cap. It's hard to defend when being shot at from 2-3 sides. TD's can also have a few free shots at the mediums rushing to CAp at the start and then turn to the bridge. Death rail: simple, there is no one chokepoint or easy route. The team that fights together wins. You really want to be 4-5 tanks pushing the same point. Follow your team. The desert sands: The south dune is a death trap with no support in the desert. Only go there when you have part of your team taking the desert route, if not a T-54 will come and kill your jagdtiger. Middleburg: Excellent fot TD's as close support, just behind the heavies. Beware of flankers, 4 ind the city, 3 on the hills always wins vs 7 in the city. Mines:never take the west route. Just doesnt work when they can hit you from 2 sides: the hill and their spawn. Beware of your team, if you have a few snipers behind you, let the reds cross the hill and try to survive. sometimes surviving in a forward position is more important than doing the hitting. Winter malinovka: I would suggest: one can not loose the hill / windmill. You can win the game there, or you can hold the enemy there and win the game in the village/taking the long road down. Ideally 4-5 go to the windmill hill, medium + TD push through centre / defend enemy flanking. I have been winning games recently by pushing through the middle quickly, killing the lone guard/camper and then engaging the windmill reds from behind. Got me a mastery yesterday. But abandoning the hill is loosing the game. When playing a medium without a good turret, you can flank, but hurry if you want to have an impact. And never do it without a TD in support on a hilltop. Fort despair: Flanking wins the game there. Oasis palms: just don't camp at spawn. Never ever.And do not go in one group either. You need to control 1 side of the map (Dunes are better) and have 1-2 spotters on the other side. Personally I always go dunes. Castilla/ Stay Together. 1 big Group (4-5) pushing one of the two sides, 2 tanks covering the middle/flank/spotting the other side should do it. Never go 3-4, there is no way one group can support the othe rin time. Edited by eliasdepelias, 01 April 2015 - 02:41 PM. winter Malinovka- all heavies rush to the windmill and the base, all the mediums camp at base and spot. when spotted, i like to tanke one sniping shot in my cromwell and then rush off past the spotted mediums. This surprises the enemy and gives the other mediums an opportunity to attack the opposing mediums. the tank that rushed past will give flank fire and spot. By utilising the "requesting fire at _______" shortcut, all heavies should push and target the targeted tank. Oasis palms- i am bad at that map, just concentrate TD at the hill, everyone else into the base and sides.